The terrific tux is Bandit, a two and a half year old beautiful boy who was pulled for an adopter off of the 9/22/14 at-risk list who changed her mind. Bandit has a fab foster mom but would love to find his furever home. 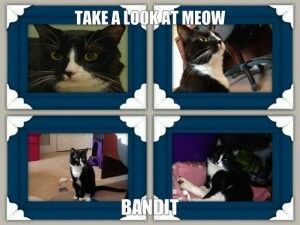 Bandit is friendly with humans and other cats. He likes to cuddle with all and play with other felines. He loves to be pet and will sleep with you too. Available for adoption through Anjellicle Cats Rescue. (Contact [email protected]).